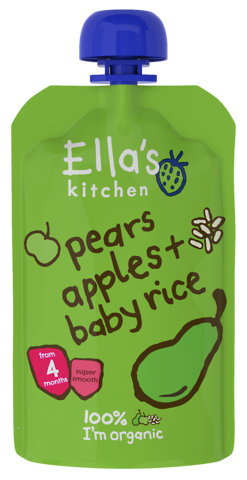 Hello, I'm 100% organic pears, apples + baby rice with a dash of lemon juice - nothing else added, not even water. Values per 100g : Energy 252kJ/60kcal, Fat <0.5g, of which saturates 0.2g, Carbohydrate 12.3g, of which sugars 9.7g, Fibre 2.3g, Protein 0.6g, Salt 0.02g. Squeeze me into a bowl or straight onto a spoon. To warm me, stand me in hot water and check I'm not too hot. Never put my pouch in the microwave.